Grooming your Biewer not only involves taking care of the coat but also taking care of the entire dog. Introduce the idea of grooming to your Biewer at an early age, around two or three months old. By familiarizing the puppy with grooming equipment and techniques, your Biewer will begin to grow accustomed to it as they get older. If you are not planning on showing your Biewer, it is not necessary to grow the hair long. Many owners prefer to have a shorter “puppy cut” because it is easier to maintain. A healthy diet is essential for any type of hair. Feeding a high quality diet can improve coat length, shine, skin irritations, allergies, and over-all health. If you notice your Biewer is developing a dull, broken, or sparse coat, diet could very well be the culprit. Everyone wants a Biewer with a beautiful coat of silk. The Biewer has a single coat, meaning there is no undercoat. The hair does not shed and is very similar to human hair making the breed hypo-allergenic in nature. 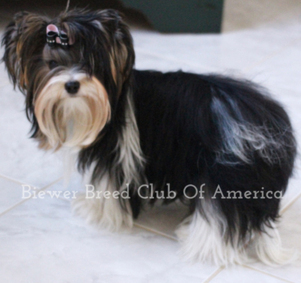 Unfortunately, not every Biewer will inherit a silky coat. Some Biewers will develop a cotton type coat. The cotton coat is thicker and mats easily. While it is difficult to grow out, daily brushing will help manage the tangles and using a good conditioner is a must. Many people discover they (and their dogs) enjoy stylish shorter cuts with this coat instead of spending hours grooming. Biewers should be bathed every week or two. Keeping the hair clean will help promote growth and reduce tangling. There are many great products on the market for our Biewers. Investing in a good shampoo, conditioner, and detangler will make the process much easier for you and your pet. To begin grooming, start with brushing all of the tangles out. A wide tooth metal comb (often called a Greyhound Comb or Butter comb), is good for this along with a good pin brush. Don’t pull mats out, gently work them out with your fingers first and then the comb. Always work form the ends of the hair to the part closest to the body. Using detangler on the mat can be helpful, often saving a coat. Brushing the coat every day keeps tangling to a minimum. Once the tangles are out, shampoo the coat. If the coat is long, don’t scrunch the coat. Gently work the shampoo through the coat keeping it straight and untangled. Rinse the coat well so that left over shampoo doesn’t cause irritation or a dull coat. Then apply a good conditioner to the coat and rinse thoroughly. Using a sponge for the face will reduce getting soap and water in their nose, eyes, and mouth. If you notice your Biewer eyes frequently tearing, make sure you clean them daily. Tears can cause staining, an unpleasant odor, irritation, and infection. It doesn’t mean there is something wrong with your Biewer, some just tear more than others. The ears of most Biewers are erect, meaning they stand up on their own. Clean their ears with a good ear flush or powder. A dog’s ear canal curves naturally; therefore, never use a cotton swab or Q-tip to clean the canal. Any unusual smell about the ear or continued scratching should be evaluated by a qualified veterinarian. The hair should be shaved on the ear 1/3 down from the tip, keeping the weight off the tip of the ear so that it doesn’t droop. It is also important to keep the pads of the feet trimmed. Hairy foot pads attract trash, create mats, and cause the dog to walk improperly. After you trim the pad itself, trim around the foot when overgrown. You should also trim around less sanitary areas and the overall coat as needed. Cleaning teeth is very important to the health of your Biewer. Not only does it keep them white with sweet smelling breath, but it also helps to retain adult teeth. There are numerous ways to clean teeth from pet toothbrushes and pastes to spray and pretreated pads. No matter what method you choose, gently wipe the teeth from front to back. Cleaning teeth routinely will help them stay more healthy for years to come. You will also need to have them periodically cleaned by your veterinarian. Toenails should be cut regularly at least every two weeks. Cut the nail at the curve, avoiding the fleshy part of the nail, in order to keep it from bleeding. Make sure you cut the nail at an angle, like the natural wear of the nail.